Bethany-Elizabeth Faye Hansen, author of Frosty My Spirit Guide: How Changing Our Perceptions of Death Can Bring Us More Love, Joy, Happiness and Life! I was struck and comforted by the journey written and described in great detail by Bethany-Elizabeth in this touching story. Although I am not a pet owner, I could feel the different stages she went through, before, during, and after Frosty's passing, and it helped me in dealing with the passing of my son. 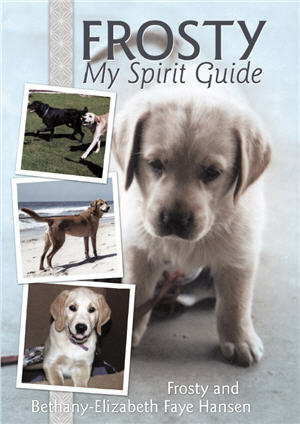 This inspiring book also sheds light on our relationship with Spirit, which is all around us, so we know we are always with our loved ones. And, Bethany-Elizabeth shows us very well in her book that our animal friends are as much a part of Spirit as our human friends, and all forms of life. Thank you for your wonderful book! Catherine from Ca. Like so many of us, I've lost near-and-dear ones: workmates, personal heroes, close friends, and family (both two and four-legged members). Each time it felt as if there was a vacuum, a hole left behind that used to be invitingly full and rich. Reading Frosty, My Spirit Guide, reminded me that the loss is just the physical body. Those cherished spirits, energies, and gifts are still within my reach. I just have to tap in mentally and emotionally to reconnect. Indeed, now I have my beloved dad tapping me on the shoulder. And two sweet deceased cats, talking to our new one because she is definitely up on their tricks and antics, and knows a few secrets only they knew! Ya gotta love them and laugh. The author's chronology of the grieving process was personal, but also universal. It's reassuring to know that it is a process. I could relate to so many feelings and stages along her path. It is a path, I suppose, because there is an outcome, a destination. Perhaps it's the healing we all need to pass through. It's reassuring to know we are not alone. KC from Ca.